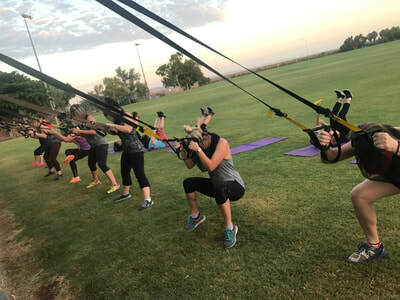 ​This is Outdoor Functional Fitness at its finest! A comfortable and relaxed team environment where you feel supported on your fitness journey every step of the way. A variety of different exercises are utilised to keep every work out interesting and effective. We utilise body resistance, weight based workouts, TRX suspension trainers, cardio, VipR and more! We keep our groups small and controlled, so you get plenty of one-on-one time and coaching with the trainer for optimum results! One on One sessions, or small groups (1-3) are trained in our indoor studio, or outdoors if preferred. Here you have your own personal coach so you can narrow in on your goals with workouts tailored to your specific needs; wether it be injury recovery, sports specific training, weight loss, strength and conditioning - or even if you just need extra one on one support to get you started, then Personal Training may be for you! April utilises the healing ability of Nutrition to rectify imbalances in the body, to improve dis-ease states and promote health and wellbeing. April is a passionate Nutritionist and Foodie, moving clients away from a place of 'dieting' and 'deprivation' and into a place of sustainable balance and enjoyment. Each client she sees is given a completely unique approach and plan depending on what your individual needs are, coupled with ongoing motivation and support to see you reach your goals with a smile. - Cost is $150 for the initial and $65 for Follow Ups (these fees can be claimed on private health cover for Australian patients). 4 or 6 week Nutrition and Fitness programs targeted at "jump-starting your journey" and get you closer to your health and fitness goals with extra support and guidance. The Infrared Sauna comes with a whole host of different health benefits and is a great addition to anyone seeking optimum health and wellbeing, whether its to reduce pain and inflammation from injuries, enhance detoxification, improve skin health or aid weightloss - the sauna is for you! Take time out from your daily grind, and flit away to tropical Bali for 7 days to be pampered and indulged while you finally get the chance to put your own needs FIRST. ​The ultimate package for anyone seeking the best investment possible for their health and wellbeing.